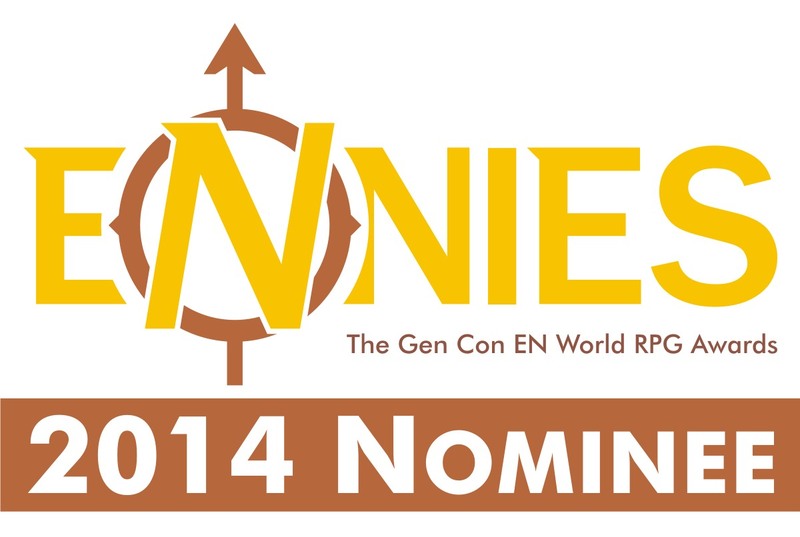 I am participating in "Basic Fantasy Role Playing Blog Appreciation Day" hosted by Tenkar's Tavern. I really enjoy Basic Fantasy. For me this is the D&D Basic/Advanced hybrid I was playing in 1981-83. I liked Basic D&D and I loved Advanced D&D, just not every part of each. The game we played was mostly Basic/Expert with bits of Advanced thrown in. There were no "races as classes" and instead it was class and race. We didn't worry about weapon speeds, or to hit bonuses for different ACs and weapons (though I kind of dig that stuff now). We wanted simple, fast and fun. All just like Basic Fantasy. 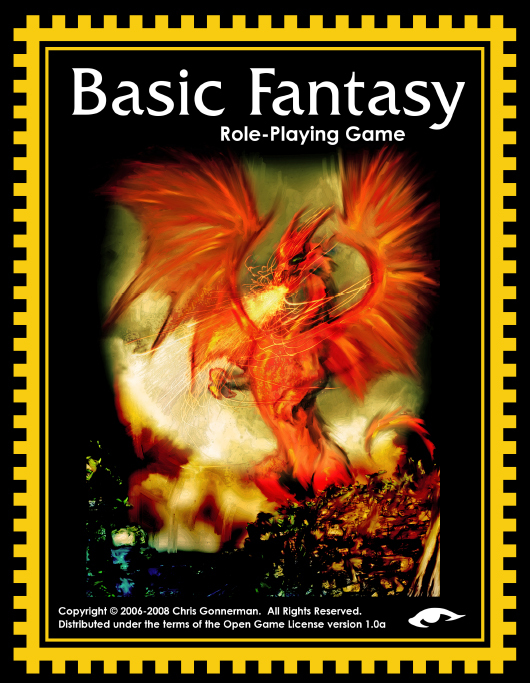 Basic Fantasy has suffered a bit I think because it tends to be overshadowed by Labyrinth Lord. There is nothing wrong with either game, and I proudly own both, LL just has better (and dare I say, more aggressive) PR. Even I was not that familiar with it back when I started doing this OSR thing. Basic Fantasy though has a lot going for it. For starters, it is free. 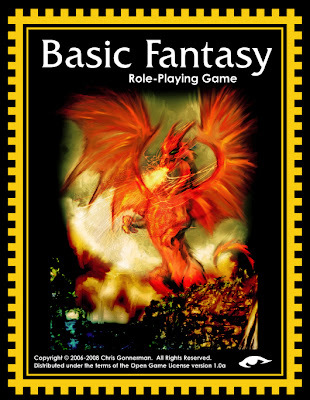 You just go to the Basic Fantasy website, http://www.basicfantasy.org/, and grab a full version. Grab other stuff too, it's all free as well. Even the books on Lulu are sold at cost to keep the price down. I also like it because it sticks closer to the SRD in terms of descriptions. This is a good thing because for me it also acts as a nice bridge game between editions. It also means that things that were not in the original Basic Game but are in 3.x/SRD can be converted back fairly easy. Love 3e Sorcerers? Love Basic? Well conversion then is pretty easy. I also like it because it reminds me more of the Eric Holmes edition of Basic. Labyrinth Lord feels more like Moldvay/Cook/Marsh. Holmes was my first D&D. Since Basic Fantasy is so very close to Holmes and close to the SRD, I did a lot of playtesting of The Witch using these rules. I think I can say, without worry, that The Witch and Basic Fantasy get along fantastic together. 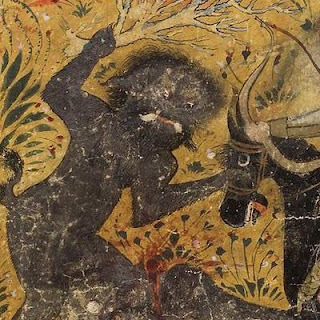 One of the assumptions of the Witch class is that it can be open to any race. I have an appendix in the back of the book to use demi-humans either as race-as-a-class or race-as-a-Witch-Tradition. Either way you go, I have you covered. Of course I do prefer to have my spells to go a bit higher in level. BFRPG caps at level 6, the witch goes to 8. But I cover 7th and 8th level spells as special. To make many allowances to cover the most games there are some odd specific game quirks. So here is my recommendations for using my Witch class in BFRPG. Limit the witch to 20th level. So no Witches Court witches, a witch of 20th level is the Queen of Witches. At 13th level a witch can cast a 7th level spell only if she is part of a coven. The witches in the coven must also know the spell. Same for 15th level and 8th level spells. OR drop the 7th and 8th spells completely. In the spirit of BFRPG, here is a free preview of The Witch. If I have done nothing else in this post, then I hope you will at least give Basic Fantasy a try. The price is right, the game is solid and you have nothing to loose. Even if you have never played an RPG in your life then you also can't go wrong here. You can even try the Beginner's Essentials from the downloads page. Again for the fair price of $0.00. New to Old School Gaming: Give this game a try. It does a great job of handling the "farm kid to hero" arc that is so important in so many tales and games. I enjoy 3E and 4E, but the characters can start out so powerful; especially in Pathfinder and 4e. NON-GAMERS: If you ever wanted some insight to what I talk about around here, then grab this free copy. It is a complete game. Just add dice and friends. Want to know more? Visit Tenkar's Tavern to see all the other blogs participating. 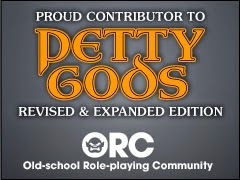 EDITED TO ADD: Chris Gonnerman, the brains behind BFRPG has a blog up as well.